It's time for me to come clean about something: I've got a hell of a man crush on Tom Hardy. I think he's one of the finest and most entertaining actors around right now, and I absolutely love the way he completely disappears into his roles. It always seems to me that he doesn't just act his roles, he lives them, and that's a powerful difference. His character in The Drop, Bob Saginowski, might not be as out there as some of his other roles, but that doesn't make his performance, one that is simultaneously quietly charming and subtly dangerous, any less impressive. And of course, it doesn't hurt that he shares half his screen time with the actor playing Bob's cousin Marv, the late, great James Gandolfini. 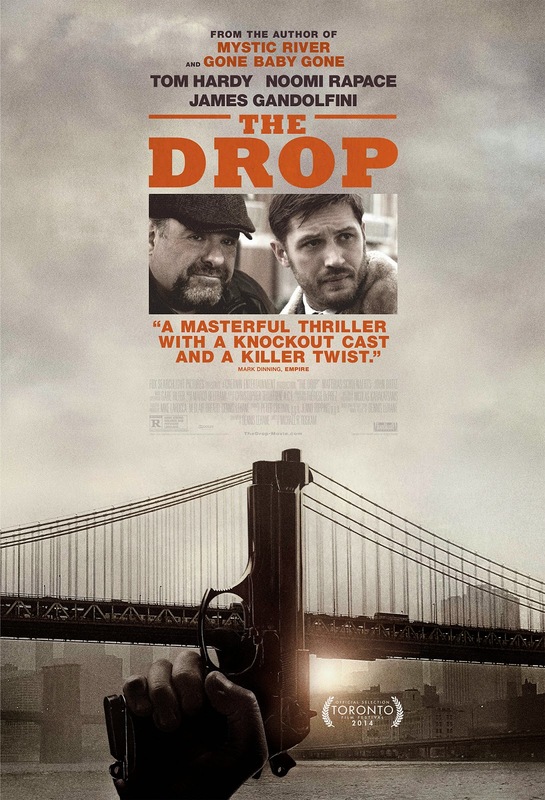 IMDB has The Drop listed as Gandolfini's final film role, and if that's the case, his career ended on as high a note as it always tended to hit. In fact, the acting is definitely a major strength of this film all the way around. Hardy and Gandolfini positively crackle when they're on together, but they're only half the story; Noomi Rapace is fantastic as the piece's female lead, Nadia. She's a great foil to the sometimes confused Bob, equal parts anger and vulnerability. But the real star of the supporting cast is Matthias Schoenaerts, who plays local lowlife Eric Deeds. He ends up being one of the best quietly menacing villains I've seen in some time, another joy to watch act against Hardy. But I don't want to make you think this movie is carried solely by great acting performances, because it has a lot more than that going for it. Written by Dennis Lehane (based on his own short story called "Animal Rescue"), the movie's plot is great. There's a mystery (or two) at the center of it, starting with a robbery and the discovery of an abused dog in a garbage can, two disparate threads that weave together through twists and turns to a great ending. The dialogue throughout is smart and funny, and the characters all come across fully formed and real. Part of that is the writing and acting, but the direction deserves its due as well. Michaël R. Roskam shows an incredible amount of talent here in the way he sets scenes and atmosphere, making Brooklyn pop so much it's its own character; in the camera shots he goes for; and in what he is able to get out of his actors. And in the end that's what it comes back to: while the writing and direction are both great, it's the cast that really make this gem of a movie shine. I went into it with very little foreknowledge and no expectations, and came out of it having the one of the best times I had at a movie this summer that wasn't Guardians of the Galaxy. This movie get 4 out of 5 stars and a "must see" recommendation from me.